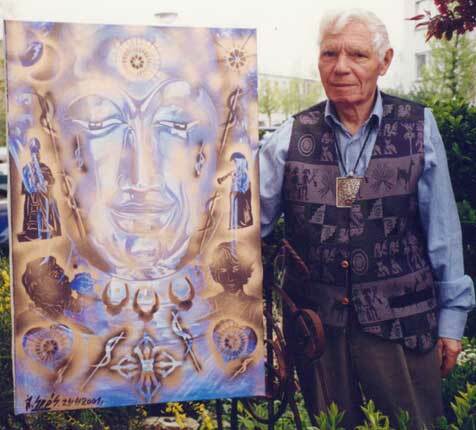 This is an explanation of the seven sources of knowledge in the life of Hungarian shaman Joska Soos, in his own words. The original text is in Dutch. I translated it from the book Joska Soos, Ik Genees Niet, Ik Herstel de Harmonie into English(© copyright for the translation by Dirk Gillabel, 2014). I have also added illustrations. You are free to reproduce this text if used for non-profit, educational purposes, and you provide a link back to the URL of this page. I distinguish seven sources of knowledge that have helped me. Many people will recognize these sources, and they can use them or look for them. 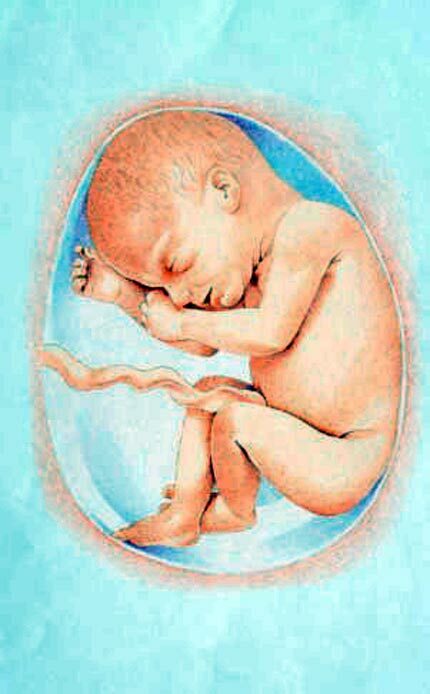 The first source is my birth with the caul. Even if we put the biological advantages of it aside, it is a rare event. Of course, this is not a merit, but is a rare happening, and a reason to be proud of it, to have a stronger self-awareness. I am a rare bird, and nobody can dispute that. Secondly, I am from a shaman family, or rather, a shaman clan. Many spiritual people come from a spiritual family tradition. I am convinced that the Frisians [The Frisians are a Germanic ethnic group native to the coastal parts of the Netherlands and Germany] also had shaman clans. Of course, not only by the Frisians, but they have the megaliths, which points to the existence of a shamanic culture a long time ago. 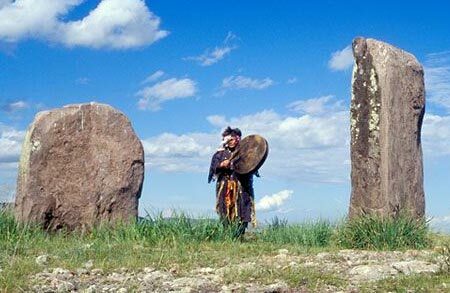 Only dignitaries, who were or spiritual or worldly, were buried in these megaliths, and they still radiate their spiritual power. Recently, a friend of mine, from Groningen [Holland] was here, and I said to him: “You have to try to find a holy place to meditate. Any place. That can be a church, or a small chapel, or a quiet cemetery. As long as it is old, because on these places is present a lot of beliefs and power. Try to find something, a tree or a mill. A mill is also a holy place, because it is a temple of food for humans. It feeds the body in order for the spirit to manifest. So, that is also a spiritual place, or find a megalithic place. “Yes”, he said, “Now I remember that a couple of years ago, I often went to a megalith to rest or to study, and now I understand why I was feeling so quiet at that place. In the future I will meditate there consciously. In this manner one can contact his ancestors with which one is connected on the spiritual level. Sometimes you can feel an affinity with, for example, the Druids, without any obvious signs that you are descendant from that clan. Maybe you are a changeling, because that exists too. Or you are a descendant in spirit, having a spiritual connection which can be strong. Or find a spot that you really like, because everyone has a rich genetic heritage that can bring you in contact with a spiritual past. The third source of knowledge, or rather of inner development, is that I have met my master, who never portrayed himself openly as a master. I had the advantage of meeting a spiritual guide, Tamas Bacsi, who was of a shaman clan himself. However, anybody can meet such a person during his life, an old man or woman, who can inspire you with enthusiasm. You don’t have to seek, it will come spontaneously, a living person, or even somebody who is deceased, of which only the writings remain, because the psychic connection is not limited to time or space. The fourth source is the endless thirst for knowledge, that is important. “One has to cultivate his abilities to wonder”, Tamas Bacsi said. That is the mother of knowledge, to be able to wonder. These impressions remain, when we experience something in wonderment’ then we never forget. That is the same in school. When the teacher makes me wonder then it stays inside my head, but all the rest I forget. It has to be knowledge that is in connection with being able to do, because these two, knowledge and being able to do, have to go together. 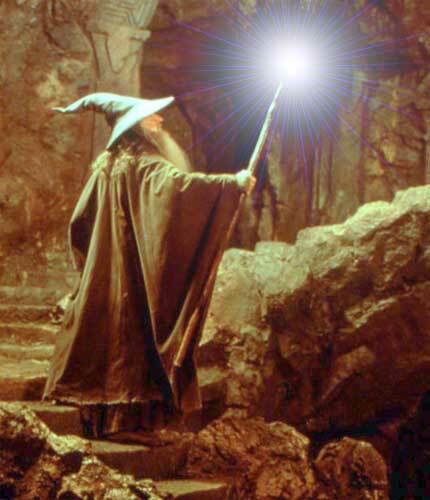 The true spiritual man begins with the sorcerer or sorceress, who are able to do, but have little or no knowledge. They can apply something, for example, herbs, but without really knowing how it works. Or they can use or apply the earth energies without knowing how they really work. Only the magician has at his disposal knowledge and the ability to do. Actually, there are seven types of men and women. The first one is the guy or bloke, the male, only in the sense that he is a stallion; he is oriented only on the everyday matters and the sensual. Equally, so for the wife, but she is not nothing. The wife has power, earthy power, rooted in the bodily being; at present this is almost non-existent. Then there is the women. She becomes women when she is a mother. Then she becomes complete on the bodily, psychological, and psychic level. Thus, that is more than the wife. When the wife becomes mother, her heart chakra opens. She opens herself for the endless love, to give without expecting any return, because one cannot expect anything from a child. The witch is the one who can manipulate the energies of nature without knowing what she is manipulating. It is like driving a car, but when the car is broke, you can’t repair it. Then you have to leave the car behind and go on foot. The magician is the one who can not only drive the car but also repair what has been broken; or at least can see what is broken. Then we have the fay. The fay is the one who gets the energies from above, from the cosmic; and of course, she is also open for other powers. However, she is in service of the spiritual. Above this, is the lady, the cosmic lady. The Catholics call her Our Lady. This is very rare. Above her we have the Goddess. It is the same with men. There are also male fairies, and the ‘monseigneur’, the master. Above that are the gods. The gods are clearly different of nature, as if they are made of other matter. The fifth source, for me, is that I am an artist. By my art I experience a special vibration. Creativity actually is a vibration, to live in an exalted state, like being in love that lasts for decades. The creative person makes something that does not exist yet. That can also be a scientist, a politician; one can be creative on all levels, also in his way of living, the artists of life. That can be very simple and at the same time of great meaning. For example, the one who first made the first horseshoes. That was a great thing because it allowed humans to use to horse without wearing out its hooves. Such an idea can be very simple, like the match. Look at what changes the match have brought us! Instead of slamming two heavy stones together to get fire, all you need now is a match box. That is also creativity. When I work, I am always in a musical mood, then I always sing. My work is not only a creation, but it arises out of a perception in a special state of mind. The sixth source of knowledge is music. Not the music that is composed, but the music I perceive, often in connection with a problem of myself or of another person. Problems can be threefold in nature: physical, psychological and psychic. The first time I heard music was in my puberty, when I was 12 1/2 years old. I was on vacation, in Solt [Hungary where Joska grew up]. It was a summer afternoon in July when I went to visit my aunt. All the farmers were working in the fields. Except for some old people and young children, there was nobody at home. I was walking on the village road when I saw a small cat on the rooftop of a house. At that the houses in Hungary were not made out of stone but out of clay and straw, with a reed roof. On such a reed roof I saw a cat that has climbed all the way up there. It didn’t dare to go any further, but it didn’t dare to come down either. That happens with cats that they dare too much and then are stuck half-way and don’t dare to come down. I was looking at the cat, and I was curious what she would do. Suddenly, from my right side, I heared the sound of strings of a cello. It was as if someone started to play a piece of Beethoven. Instinctively, I turned, because it was so sudden, that I thought someone had turned on a radio. But it wasn’t. There were only flies, and the music continued, powerful and overtaking, as if a storm is coming over. Suddenly the words of my master Tamas Bacsi came up in my mind. He had told me that when you hear the sound arise, in a any way, you have to stop it immediately. You have to give yourself the command not to hear it. You turn it off, and then in your mind, you turn it on quietly, and then turn it off again. You do this as long as it takes, to master this completely in order to listen to it quietly. If you don’t do this you run the risk confuse your mind. This has happened before in history. Robert Schumann, the composer said: “The air is full of music”, and he went mad. He wasn’t able to master himself anymore in order to write down what he heared. He had lost the connection between the perceived reality and the concrete reality. Therefore, he got confused and died. 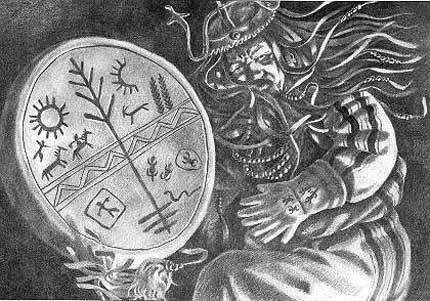 Also, the famous Hungarian V. Dioszegi, a specialist in shamanism, died to such a shamanic illness, a few weeks before we would have met. Tamas Bacsi had warned us about this, because the psychiatric institutions are full of people who hear voices or music that they cannot turn off. It can happen to anybody, that they hear a sound. It is important that they immediately turn it of, and say, not now, I don’t want to listen to it now, and then later turn it on again. Sound is not just sound, it is also vibration. It is a message from something, of the material world. Only matter sounds, matter as vibration sounds. Even a thought is matter, a fine vibration. That has opened the universe for me, in all its manifestation forms as sound. Tamas Bacsi often said: “Sound is of prime importance.” Because everything is vibration, everything can be reached, handled and understood by vibration. Of course, this is theoretically. The creative man have to transform this into action. 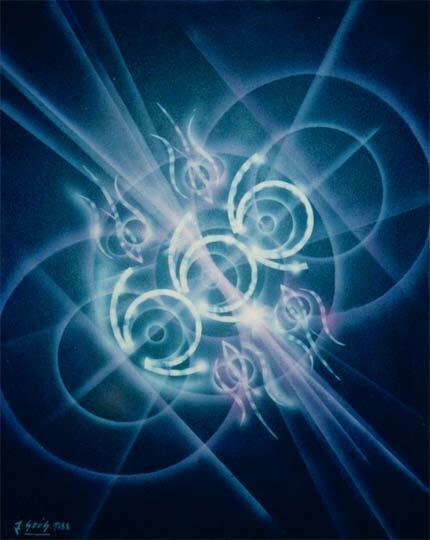 Then the vibration can create something that did not exist yet; a painting, a mathematical formula or a music piece. For me, the sound brought me in connection with the unity of all things. That happened by a dramatic experience, when my wife left me. Then I understood that everything is sound; that you can do everything with sound when you let yourself be worked by the sound. One really has to subject oneself, to open oneself, to go blindly. That is the sixth source of knowledge. In regard to the cat, that was an ordinary happening. That was no special meditation, or years of psycho-analysis. At that time I didn’t quite know what happened, but now I understand it. My attention was so strongly focused on what might happen, that the creativity of the sound arose. Thus, an ordinary happening can give rise to a revelation, as a family crisis can also be a revelation in many aspects. 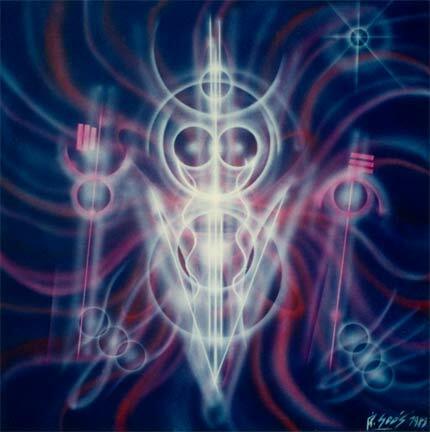 The seventh source is the apparition of the light beings. Light beings are twofold. One kind I perceive as a play of light like a prism, and is of a physical appearance. The other is a psychic appearance, which has a great consciousness. Here someone is working, is creating. These are the Demiurges, the Bodhisattvas, the Creators, which are called angels or archangels in Christianity, the seven choirs of angels. Then I entered into another state of consciousness, and I heared sounds that I could not sing. Normally one has to sing the sounds one hears. Never make something up in your head, but you have to sing the sounds that arise from a specific problem. At that time, my problem was to go through this hard, invisible wall. Suddenly, the sound stopped, and the inner voice said: “Listen, listen to the silence, and listen more.” There was nothing, no sound, only light. I remembered that in several religions they teach you to go towards the silence, the absolute silence. There is the spirit, there is God, there something has to happen. But nothing happened. I continued listening, and the inner voice said: “Continue.” Thus I sang and drummed four or five days long, with a few breaks of course. Then I heard a soft humming, voices as if of made of glass or silver. I listened, and they increased in volume. I discovered that the silence does not exist. In the silence are again sounds, unimaginable fine sounds. I continued with listening and observing, and after a couple of days, again silence, but this was a much more profound silence. The inner voice said: “Continue singing.” In this silence I heard more subtle sounds. But nothing happened. The only thing that happened was a more profound silence and more subtle sounds. I arrived at the third silence, and I thought, three is a holy number, the trinity; now something must happen. I was feeling again in the same wonderment as when I was boy, when I would go out at night and stare at the water of the river Donau. But nothing happened. This continued for more than 147 silences. It lasted months, it lasted more than two years. Nothing special happened. The only thing that happened was that the silence became deeper and the sounds more subtle. All this happened in relation to the light beings. 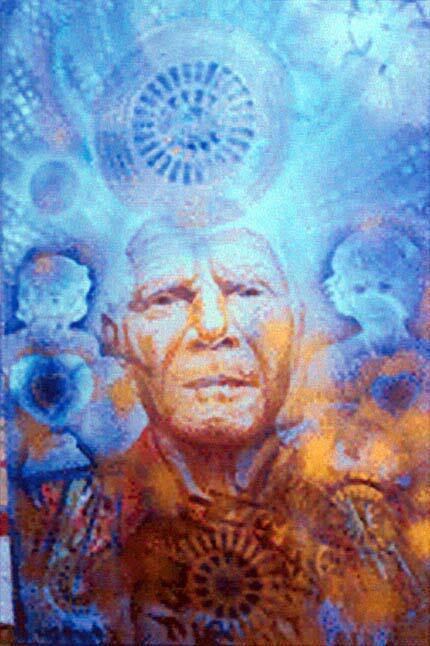 I started to understand that the light beings were sending or radiating me knowledge and energy. I also understood the significance of the sounding silence, and that I could not approach the light beings. One day I was able to approach one so close as if it was the full moon. I was standing at the table and sang, and saw the light being. Suddenly I was hit in the neck and I fell down unconsciously. That happened at 11 o’clock in the morning, and I regained consciousness at 5 o’clock in the afternoon. I had been in coma for 6 hours. I didn’t remember what had happened. I only recalled that I was hit by an enormous force in the neck, and an extremely high heat ran up my spine and exited by the neck. The heat was so intense that I did not know if it was heat or cold, because cold can also burn. Actually it was nor heat nor cold, it was something else. The next morning I shamanized to get an answer. The same light being appeared. It was of such a nice rose-red color, so colorful. The inner voice said: “You see, you would have been destroyed if you had approached it even further. They are so intense, just look at them from star distance. If they want to communicate they will that from star distance. Since then, I have discovered other sources of knowledge, or rather, they have revealed themselves to me. However, these are not for public use.